With the possible exception of Saving Mr. Banks, there's not a Disney film in recent memory that fans have rooted for more than Brad Bird's Tomorrowland. Even those with the most rudimentary knowledge of Disney history have been struck giddy with the prospect of seeing the 1964-65 New York World's Fair recreated on screen and the unapologetic optimism of Walt Disney captured for the world to see. This is the movie that was destined to take Walt's vision of the future and weave it into a sci-fi flight of fantasy that restores our faith in humanity. That's a mighty tall order, even for a director as capable as Brad Bird. And despite his most earnest efforts, he doesn't quite pull it off. Tomorrowland has moments of wide-eyed exhilaration and unwavering optimism, but it's also talky, preachy and, by story's end, a bit of a muddle. Casey (Britt Robertson) is a forward-thinking young woman who refuses to accept that the troubles of modern society like war, terrorism and climate change are totally without solutions. She asks "Why?" and "Why not?" questions of her teachers, who are so entrenched in the doom and gloom of 24-hour news streams that they can't bother to acknowledge Casey's idealistic challenges. Even her father (Tim McGraw), a NASA engineer on the verge of being laid off, thinks his daughter is foolish to try to postpone life's inevitabilities, which Casey attempts to do by sabotaging abandoned launchpads at Cape Canaveral in an effort to sustain her dad's tenuous job security. 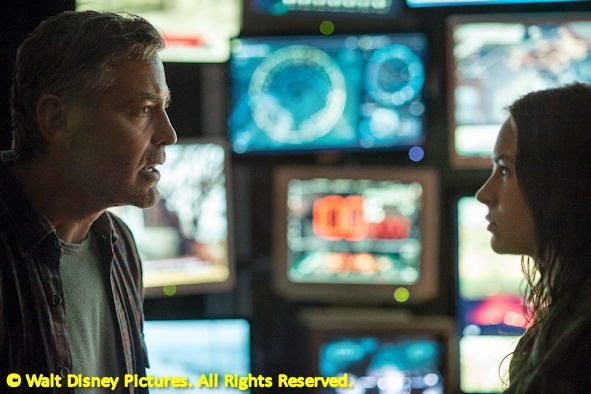 Frank (George Clooney) and Casey in Tomorrowland. Casey's life changes suddenly when she comes into the possession of a pin that magically transports her to Tomorrowland, a futuristic place where all of mankind's best ideas have been brought together. It's a glistening, otherworldly city jam-packed with jetpacks, flying cars and ethnically diverse citizens happily looking forward to the next great adventure. But is it real? And how exactly did Casey get there? Why did she end up with a magic pin? Even more important, after returning to the present day and time, how can she get back to Tomorrowland again? 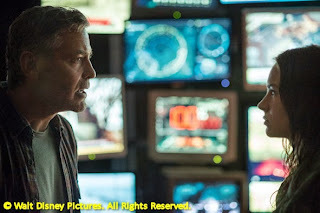 The answers may lie with two people: Athena (Raffey Cassidy), a mysterious, wiser-than-her-years girl who has a knack for spotting optimistic types like Casey, and Frank (George Clooney), a jaded technical genius who, as a boy, knew the wonders of Tomorrowland but was ultimately betrayed by them. Together, Casey, Athena and Frank embark on an adventure full of teleportation, rocket flights and killer robots--because not everyone wants the trio to find Tomorrowland and fix the future. 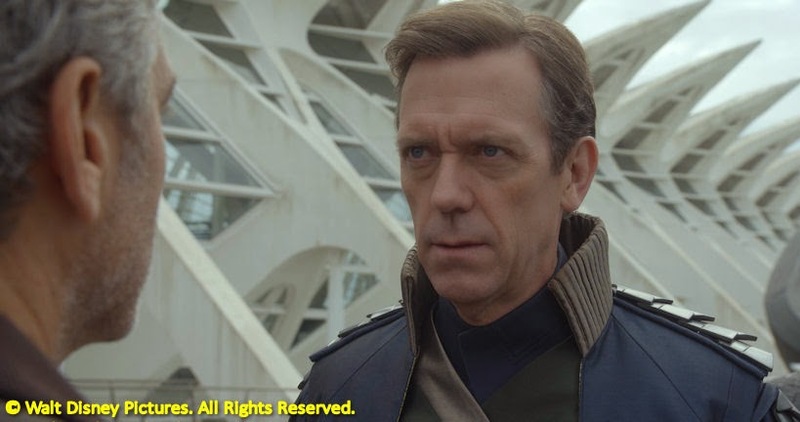 George Clooney and Hugh Laurie in Tomorrowland. Bird, who also co-wrote the screenplay with Damon Lindelof, set out to tell a story that was markedly different from the dystopian sci-fi tales that have become the norm in Hollywood since Blade Runner. 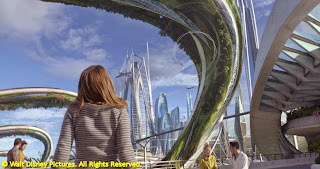 The pervasive theme in Tomorrowland is yeah, the world is pretty screwed up, but we really have the power to change that if we just stay positive and work towards a better future. It's a refreshing notion...to a point. Early on, Bird revels in showing us how exciting the future can be. Heck, he opens the movie with a flashback to the World's Fair (exquisitely realized) where Walt Disney held court with no less than four attractions. It was a time when the future looked brighter and young Frank (Thomas Robinson) is in the thick of it, showing off a jetpack of his own design. Circumstances will soon lead him to Tomorrowland (who knew there was a secret portal beneath it's a small world?). After that, for the majority of the film, Bird keeps the action moving at a spirited pace. 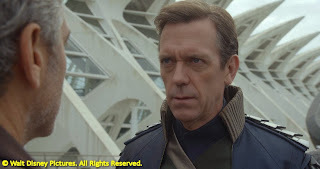 But, then the movie bogs down in the final twenty minutes as the characters start speechifying about self-fulfilling prophecies and controlling our destinies (to his credit, Hugh Laurie does the best here as a dour scientific-type who has his own secrets about Tomorrowland). We're left with an ending that feels more forced than uplifting and more manipulative than inspiring. 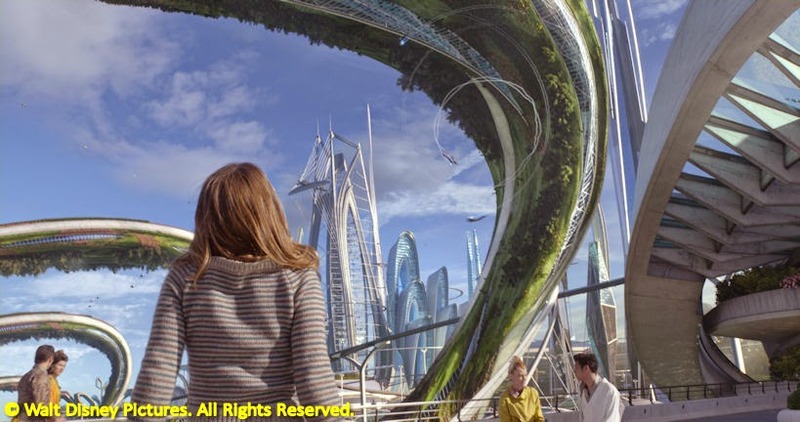 Just as the future isn't what it used to be, Tomorrowland isn't as good as it could have been.